When your phone rings and you miss the call, do you call back to see who it was? Con artists know a lot of us will do that, and they’re using this curiosity factor to cram unauthorized charges onto people’s phone bills, CNBC reports. The Better Business Bureau recently issued a fraud alert for the “one ring scam” after being contacted by people all across the country. Here’s how it works. The scammers use automatic dialers to randomly call phone numbers. After the first ring, they disconnect. The bad guys hope you’ll see that number in your missed call log and be curious enough to return it. Make that call and they’ve got you. Katherine Hutt, director of communications at the Council of Better Business Bureaus, said this “ring and run” scam is highly effective because it’s so simple. Those area codes include Antigua (268), British Virgin Islands (284), Dominican Republic (809), Grenada (473), Jamaica (876) and Turks & Caicos Islands (649). Crooks in Antigua called J.P. Flachier a few weeks ago. 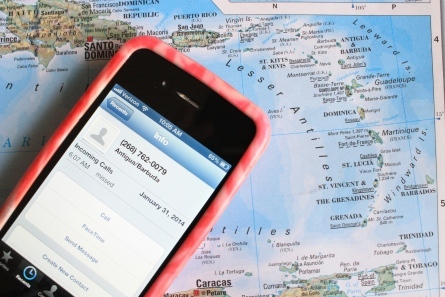 His wife was traveling that day, so he thought it was important to return the missed call, never suspecting that the area code was in the Caribbean. The call was answered with music and a recording that said, “Hold on for the operator.” That’s a common trick, designed to keep you on the line as long as possible in order to rack up those additional per-minute charges. Luckily, Flachier thought “something was weird” and hung up right away. So far, no suspicious charges on his bill, but he plans to keep checking. People with mobile devices are the prime target for this dial-and-disconnect scam because every cellphone has caller ID and a missed call log. And since long-distance calls are typically free with wireless plans, most of us don’t think twice about placing a call to another area code that appears to be in the U.S. With a cellphone, you don’t even need to dial a 1 first. To beat the bad guys, you need to stop and think before you return any unknown call. You can Google the number, to check the area code and see if there are any scam reports. Better yet, just ignore it. If you fell for this scam, contact your cell provider right away and keep an eye on future phone bills for other unauthorized charges that might follow. You should also file a complaint with the Federal Trade Commission. The FTC has a tip sheet on How to Beat a Mobile Cramming Scam.